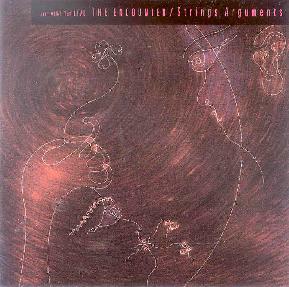 Strings Arguments - "The Encounter"
Strings Arguments are a Japanese quintet who play a fiery brand of 70's styled jazz rock fusion. The band consists of Hirofumi Okamoto on guitar, Shinju Odajima on guitar, Akihisa Tsuboy on violin, Hideyuki Shima on bass, and Hiroshi "Gori" Matsuda on drums. The album was recorded live in Kyoto, Japan on January 14, 2002. The CD opens with a track entitled "Improvisation". While jazz fusion is apparent in the music, for the most part I hear complex RIO rock structures. (Dig that wah guitar.) The rhythm section is solid and the bass and drums quite capably travel in their own realms, making their own unique statements while in full cooperation with the ensemble. But with "From Sri Lanka To Titan", Strings Arguments' primary sound kicks in. The promo sheet references Weather Report, Al Di Meola, Pat Metheny and Jean-Luc Ponty. I would have cut right to Mahavishnu Orchestra and Return To Forever, though the music also has a rawer Rock based edge and I hear the spirit of King Crimson and even Soft Machine at times too. Personally I like the dirtier Rock edge though I'm confident that fans of 1970's jazz fusion will be pleased, if not necessarily delighted. "Silence, Darkness" and "Kundabufter" were the tracks that excited me the most. Both fire off fantastic jamming fusion guitar and violin. Really HOT stuff! But the former also includes some excellent bits of Funk fusion that are reminiscent of electric Miles Davis, and "Kundabufter" blasts into a freakout segment that I enjoyed. "Everything Becomes Circle" and "Kyoto No Natsu" were the only tracks that I didn't particularly care for, consisting of melodic jazz fusion that is very nice but lacks the fire and complexity of the other tracks. The good stuff on this album is red hot and will appeal to fans of energetic 70's influenced jazz fusion.